Whom did I have to call first from the hospital when my two kids were born? Whose approval did I need for what I could name my two kids? Whose approval did I need to buy a share of a house? Whom did I have to notify if I was leaving town on a business trip? Whom did I have to notify first, immediately after I defended my dissertation? Who chose my future marriage partners (I’ve had more than one UBF “fiancee”)? Who approved the place and date of the wedding? Who ordered that I undergo asian blepharoplasty? The answer to all of these questions and more is “Sam Lee,” who was to be for me THE “servant of God.” What important–and even some unimportant–areas of my life were not subject to the rule of Sam Lee? None. Who were the agents who encouraged and enforced the rule of Sam Lee in all the important areas of my life? My own parents, the model UBF citizens, who walked on eggshells their entire UBF lives around this one man, who “lived before men” their whole lives. That life was to be my inheritance (1 Pe 1:18). It was a miracle, a true miracle, the day those shackles were finally broken, and God wrested the reigns of my life away from men. Thank you, Lord Jesus, for such freedom was part of what you paid the ultimate price for (1 Pe 1:19). I’m even happier for my kids. … as opposed to this. I choose the King in the manger, not the little, puffed-up Herod behind the pulpit and his ever-faithful minions. Let’s say a long-time alcohol abuser wrote to his estranged wife whom he battered for years: “If I have done anything to offend you, I apologize and ask your forgiveness.” How do you think she’d react? How should she react? Could you blame her? See stupid UBF defense trick #1: Everything is about subjective feelings; you FELT “hurt” or you FELT “offended.” No, the problem isn’t that people (plural) were “offended” by what UBF subjected them to. The problem is that actual, specific abuses were ordered, took place and were approved of, for which there must be renunciation and accountability. It’s not that you “upset” some “overly-sensitive” members as you may claim; it’s that you committed or approved of practices that are absolutely wrong and resulted in real damage in people’s lives. Sorry, we can see through your half-hearted apologies. And unfortunately, this hasn’t changed: UBF’s practices are still spiritually abusive, and those in positions of authority still stand in approval of past and present abuses. Half-hearted apologies are but a symptom of this reality. Even a sincere-sounding apology, though a definite improvement, would not be a guarantee that abuses and sins have been repented of. More than apologies (words) are needed. Even so, now I realize that there are so many innocent victims and my silence cannot be justified any longer. My forgiveness also does not exclude speaking the truth (Eph 4:15). Biblical forgiveness should not require an apology, half-hearted or otherwise. But biblical forgiveness does not equal reconciliation with a repeat abuser (or repeat abuser supporter). Reconciliation is so much more complicated and costly. And unlike forgiveness, reconciliation (among people) may not be an absolute necessity. The worst response of all: "I don’t care." Disregard and contempt for UBF victims from people like Sarah Barry and John Jun is to be expected. UBF is their life’s work after all. You wouldn’t expect them to admit things that would serve to tear down their creation. Plus, they’re just plain cult leader types, having amply demonstrated their inverted morality in propping up someone who was just plain evil in words and deeds. You expect them to defend UBF with all their strength, blame the victims, twist the scriptures, lie, all with a sick smile. You can’t expect them to feel compassion for the victims of what they built up. They’re now beings who are incapable of such compassion. Then there are those who know better, who know the extent to which UBF has victimized people, who know the stories are true, whose friends have left UBF due to abuse. What keeps them in UBF? “I don’t care. I don’t care. Those things didn’t happen to me. I don’t care. I personally wasn’t treated like that. I don’t care. I was only abused a little bit a long time ago. I don’t care. I don’t care…” I’m not saying that Abe Lincoln fits in this category. He may very well fit in the Barry/Jun category. But his words capture perfectly the self-centered attitude that “overcomes” compassion and conscience, the attitude that disgusts me most. The [UBF spokesperson] also uses an unspoken but common UBF tactic against those who leave UBF on not-good terms (i.e. almost everyone who leaves), the tactic of accusing them of “unthankfulness.” “We loved you and did so much for you and put up with you and showed you ‘mercy’ for all those years when we should have kicked you out long ago. See how ‘unthankful’ you are.” But the thankfulness never seems to flow in the other direction. After all, we offered tons of money from the sweat of our brows, we cleaned the “center” bathrooms, helped with construction work on the “centers” and chapter directors’ houses, we were your errand boys and errand girls, were your secretaries and seamstresses and hair stylists and manicurists and cooks (because apparently the leader’s wife can’t cook)–all free of charge, gave up weekends and study time to practice and play music at various meetings and conferences, gave up jobs or scholarships or further study in other towns and other schools, gave up family time, all to be at your beck and call, quietly put up with you and your authoritarian control and manipulation, quietly put up with your remedial Bible interpretations and scripture twisting and hours (months, years) of incredibly repetitive meetings, laughed at any attempt at humor on your part however offensive, prayed for you almost everytime we prayed as we were taught to do, and satisfied your appetite for heaping spoonfuls of undeserved and exaggerated praise. But we’re the ones that are “unthankful?” Riiiiiight. We should have kicked you out of our lives long ago. And now you are kicked out. Thank God for that. My response: I disagree. Those who use fear and the threat of loss of salvation to enforce the need to recruit have nothing to do with God. If not the explicit loss of salvation, then those who use fear, guilt and shame to enforce the need to recruit have nothing to do with God. Those who nullify the gospel of grace with forced mission-ism are going to have some issues with God. Those who try to fit all the diverse pegs of the Holy Spirit’s gifts into the square holes of UBF’s mission-ism (the need to recruit) have little to do with God. Those who use mission-ism to promote a false sense of elitism among Christians have very little to do with Christ. Those who have to twist the truth to defend indefensible acts in their hyper-loyalty to a group have … Shall I go on? Yes, that was Barry’s favorite bit of counsel in her role as enabling mother to Sam Lee’s role as abusive father. From the 1970s onward, someone would be bothered by Sam Lee’s abusive behavior and go to her (or be sent to her), and she would proceed to “sooth” and “comfort” them in this way as they complained to her. Once Dr. Lee [Sam Lee] gave me a direction to give away my black [African American] sheep. Reluctantly I did so. Then God gave me 3 NA [white American] boys to study with. Whose theology resulted in this example of Chicago UBF’s systematic racism? It’s Barry’s theology, no? Yes, it is. Doesn’t Barry, the teacher and leader, bear the greater part of the blame here? Yes, she does. 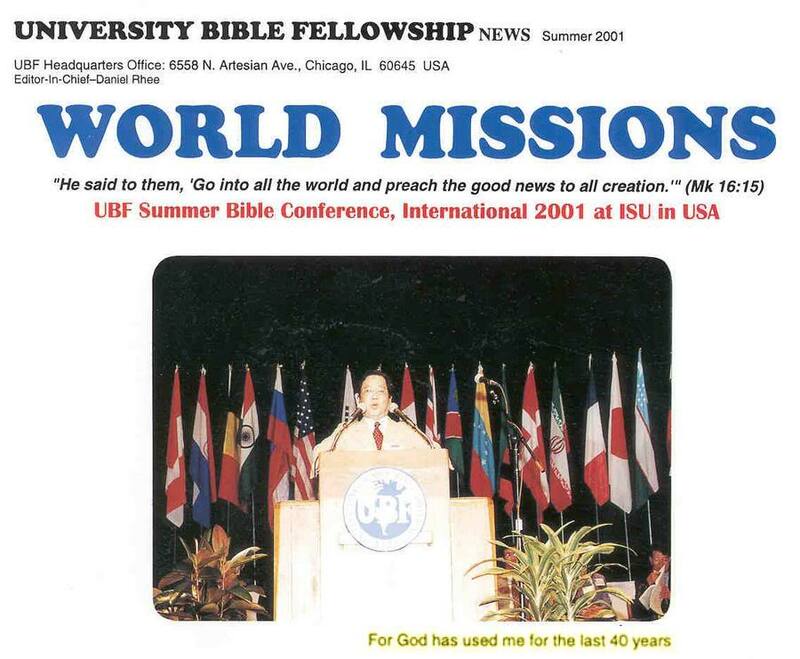 (James 3:1) “But obey him [a UBF leader] anyway…” This will be Barry’s “spiritual” legacy. And to think that she once wrote a thesis in her pre-UBF years advocating racial integration in Southern churches.